Public repositories show a link in their description pointing to the URL. Click this link to open the repository in a web browser. 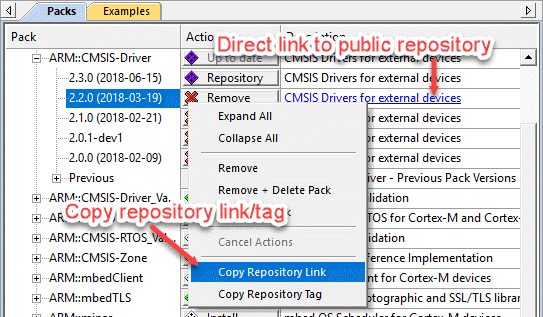 To copy the public repository's link or tag into the clipboard, right-click on the entry, and select either "Copy Repository Link" or "Copy Repository Tag". Clone the fork on your computer. Register the clone using the Manage Local Repository... menu item. Develop and test your local modification. Create a pull-request for your changes to be contributed to the upstream repository. Download and install an updated pack version containing pull request. Remove the local repository entry from Pack Installer. µVision does not make a difference between local repositories and installed packs. If a version of a pack is provided as an installed pack and a local repository, only the content from the local repository is used. Changes to the PDSC file of a local repository are not notified to running µVision instances. To reload the PDSC file, go to Project - Manage - Reload Software Packs.